Over the last one hundred years, rhododendrons have been frequently studied by scientists, hybridizers, growers, and amateurs. The vast majority of research with the genus Rhododendron concerns the horticultural uses of or systematic relationships between the species, hybrids, or other cultivars. The ecology and general physiology (bud cold temperature tolerance excluded) remain poorly understood and infrequently studied. We do know something about the growth of native evergreen rhododendrons in the southeastern United States and in Oregon. These studies have indicated that members of the genus Rhododendron can have a very significant affect on mineral cycles and succession of these forests. Few studies of rhododendron ecology or ecophysiology have been performed. Many horticulturists will agree that a thorough knowledge of a plant's ecology in its native habitat will greatly facilitate its development as a horticultural species. Rhododendrons are found worldwide, have many morphologies, and there are species found in the tropical lowlands to alpine regions. Such a diversity of morphological types across a wide habitat and climatic range is an unusual situation and an ideal situation for studying basic relationships of plants with their environment. Knowledge of rhododendron ecophysiology is also important to breeding programs. Many ecophysiology studies concern adaptations which plants have to environmental stress. Knowing which rhododendrons have particular stress tolerances and the nature of the stress tolerance mechanism will be extremely valuable for breeding new stress tolerant (low maintenance) varieties of rhododendrons. Over the past two years a rhododendron ecology research program has developed at Virginia Polytechnic Institute and State University. This research effort was initiated because of the void in ecological research on rhododendrons, the potential importance of ecological research on horticultural practices and breeding programs, as well as the value of rhododendrons as a research tool for ecologists. Currently there are several research projects being carried out at Virginia Polytechnic Institute and State University. We are investigating the influence of the canopy above rhododendrons on their productivity, photosynthesis, flowering, and nutrient cycling. We are examining which environmental factors control the length of time leaves survive in several rhododendron species. The environmental factors which control the distribution of evergreen and deciduous rhododendron species are being investigated in the mountains of southwest Virginia. Also, the proximate cause and ecological significance of the winter leaf movements in two evergreen rhododendrons are being studied. I would like to present the results on the last research project as an example of our work. Leaf curling occurs during the winter in many rhododendron species of temperate to alpine habitats. This phenomena has been observed for many years. However, the first published research project on leaf curling was done in Japan in 1933 by Fukuda on Rhododendron micranthum . Fukuda, felt that leaf curling was due to ice formation between the cells in the leaf. We now know this is not possible because curling occurs at temperature well above the freezing point of intercellular water. Rhododendron maximum leaves during the winter months in Virginia. Most casual observers, and the early researchers, were so taken with the leaf rolling phenomenon, that they failed to observe a coinciding change in the leaf angle. During the summer, mature leaves are horizontal, while during the winter mature leaves are often pendulent. Therefore, there are two leaf movements, curling and angle, which occur during the winter months. These leaf movements occur rapidly and they are reversible. Frequently in the winter, sometime after dawn, leaves of rhododendrons will move from a pendulant curled position to a semi-horizontal flat position over as little as twenty minutes. Our work has shown that leaves uncurl in response to their leaf temperature. Uncurling occurs at a leaf temperature of approximately -1 to 0°C (30-32°C). Leaf angle is responsive to both leaf temperature and light intensity. 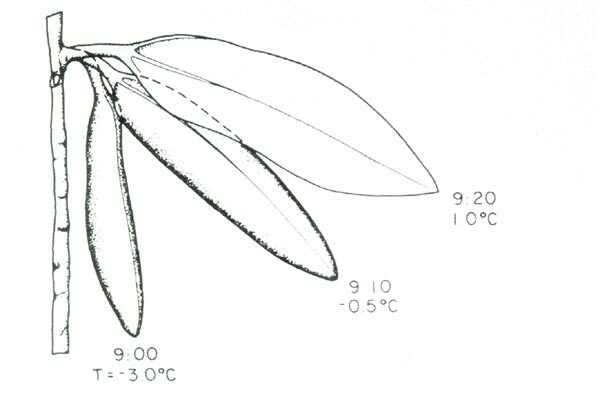 In bright environments, rhododendron leaves are more pendulant than those in shaded environments; however, leaf angle is also associated with leaf temperature. We have also studied the consequences of drought on leaf movements. During dry conditions leaves curl and droop only slightly. Less than 10% of the winter leaf movements can be explained by severe water stress. When some rhododendron species are grown in sunny locations, their leaves grow during a temporary period of water stress. The temporary water stress results in leaves which are permanently, slightly curled and pendulent. These results indicate that water stress can cause some change in leaf curling or leaf angle but temperature and light are the most important causes. These environmental causes are the triggers initiating the leaf movements and such mechanisms are called proximate causes. The ultimate cause is the adaptive significance of these movements to the growth or success of the species. There must be a significant adaptive importance to leaf movement in rhododendrons because of several lines of evidence. First the leaf anatomy is very unusual because the water and food carrying system (xylem and phloem) has a corrugated shape traveling from one side of the leaf and back. This orientation limits stretching of the rigid water conducting tissue during leaf curling. There must have been strong evolutionary pressure for leaf curling to select for such an unusual leaf anatomy. Second, if the leaves are not allowed to curl during the winter, up to 30% die. The remaining leaves have a much reduced photosynthetic rate. The leaves which are not able to curl or droop become chlorotic (yellow) before death. We believe that rhododendron leaves curl to prevent photo-oxidation (bleaching of chlorophyll) by high irradiance during cold temperatures. Other leaves have been shown to be most sensitive to photo-oxidation when they are cold. Drooped and curled leaves reduce the amount of radiation they lose. However, we have done studies which show that the leaf movements do not keep the leaves warm. Curled leaves may also limit the amount of water they lose, thereby possibly keeping the leaves hydrated during the winter when the soil is frozen. But, our measurements indicate that the leaf movements have no affect on water loss in the winter. There is definitely a significance to the two types of leaf movement in rhododendrons which protects leaves from mortality. The ultimate cause of leaf movements is most likely to avoid chlorophyll bleaching. Our work is continuing in an effort to definitively explain the significance of leaf movements to the growth and survivorship of rhododendron plants. We hope to expand our studies to other rhododendron species which show leaf movements in alpine environments. Erik T. Nilsen is Assistant Professor of Botany at VPI. He has been awarded an American Rhododendron Research Foundation Grant for 1985 for the study: "Mechanisms of Winter Stress Tolerance in Rhododendrons and Azaleas".